Thoughts from a Traveling Tech: What a Great Attitude! Stopped at a traffic light a few weeks ago I saw this sign and thought that they had the best attitude. 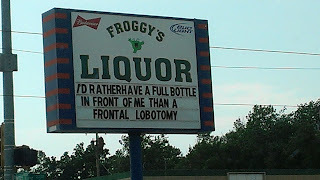 Somehow I think I would rather have my bottle of adult beverage full than have some sink a probe into my head and spin. Heck, I think I would even settle for an EMPTY bottle than the probe.